C’est magnifique Geraint declares cycling fan Mark Perryman while wondering if this might spark Wiggomania Mk II. Britain took 109 years to achieve its very first Tour de France winner in 2012. And now we can hardly stop winning it, with the single exception of Italy’s Nibali in 2014 (when Chris Froome crashed and was unable to continue) every year since. The French aren’t best pleased mind, ‘ Boring, Boring Team Sky’ amongst their less impolite responses. Each of our winners has been different. Wiggins in 2012 was impeccably English, complete with RAF roundels mod-style on his helmet and a fondness for The Jam (the band, not what we spread on our toast). His victory was immediately followed by the London 2012 Olympics where he also triumphed in the Time Trial to win a Gold Medal to add to his Yellow Jersey. Pictured astride a throne at Hampton Court, where the race ended, Bradley with Wiggomania in tow was rampant with the Union Jack enjoying a late Cool Britannia renaissance. It was a moment when most of us thought Wiggo could do no wrong, until we found out via a jiffy bag that maybe he could. Then along came Chris Froome, Wiggins’ number two in 2012 who didn’t much fancy playing second fiddle to anyone, least of all Wiggo. Born in Kenya, educated in South Africa, pays (or rather doesn’t pay) his taxes in Monaco. Never mind, he could climb a mountain on a bike like nobody else, never out of his saddle, twig-like arms outstretched with hands ‘on the hoods’ staring into the distance as if the gradient barely existed. Four wins in five years 2013- 2017, a legend in the making. The idea that in order to be a world-beating sports superstar an athlete needs the ‘personality’ to go with it is an unwelcome product of our celebritified era, but there’s not much doubt it helps. Froome’s achievements dwarf Wiggins but he was never a hit with the great British sporting public in the same way, most of whom don’t have much more than a passing interest in watching cycling. And so his near downfall via the over use of an asthma inhaler didn’t have quite the big hit of Wiggo and his dodgy jiffy bag full of we know not what. All it did was confirm those deep seated suspicions that the superhuman qualities of Grand Tour cyclists aren’t as naturally-produced as they might appear. And now we have Geraint Thomas. Previously a super-domestique, always happy and willing to help his leader, as the cliché goes road cycling is an individual sport played by teams. His emergence first to lead Le Tour and finally win it shocked just about everyone, not least himself. Yes undoubtedly the suspicions linger, cycling will never entirely be rid of these but Geraint’s is a homespun story of a Cardiff kid who joined his local cycling club, went to a secondary school with superlative sports facilities, was talent-spotted at an early age, his is a rare ability that took him first to Olympic glory and then on to the road, grinding out the hundreds of kilometres mainly in the cause of more-celebrated others. He is in this regard the perfect combination of Wiggins’ personality and Froome’s athleticism on a bike. So are we about to witness ‘Geraintmania’. If the Monday morning after the Champs Élysées triumph the afternoon before back, and in most cases front, pages are anything to go by we might like to think so. Handily sandwiched after World Cup 2018, Wimbledon and the British Open, before England’s test series against India and the start of the football season a British Tour de France win now receives the kind of blanket media coverage that before Wiggins barely existed. But somehow I doubt it. Thomas’s backstory, but particularly his Welshness, adds something to the mix however. More understated than Wiggins but one to warm to in a way Froome never quite manages. Yet short of the BBC Sports Personality of the Year award, it is hard to imagine Thomas will be much in the news in the interim. Despite that as he revelled in his victory all the media-talk was of how he would inspire others to follow him in the same way he’d been inspired to get on a bike by Le Tour as a kid. This is the cruel myth-making of any sporting triumph. Its not killjoy-like to point to the social construction of sport, rather it is the only means of understanding how to change participation from sofa-watching to getting off that sofa. Cycling in this regard has a lot going for it. A means of transport and freedom for children, a way to spend time together as a family, a means to get to work or to do the shopping for adults. And all the while we can dream we are Geraint Thomas. Yet each of these opportunities are shaped by the socio-economic. Fewer children cycle to school than ever before. Safe cycling routes to enjoy for parents and children ambling together on two wheels remain few and far between. Towns and cities are ill-equipped to cope wih expanding demand to cycle to work and we have a rail system that actively deters the carriage of cycles. Don’t believe me? Visit any other European country and both the much better participation statistics and vastly more positive lived experience of cycling over there for cycling put Britain to shame. Yes there’s been a post-Wiggins increase in cycling but mostly its been those who’ve given up one sport, anecdotally marathon-running and golf are often cited, for another, there’s been next to no overall reversal in ever-declining physical activity participation rates. So well done Geraint, but I’m afraid to change all this its going to be down to another cyclist, over to you Jeremy Corbyn. Mark Perryman is the co-founder of the ‘sporting oufitters of intellectual distinction’ aka Philosophy Football. 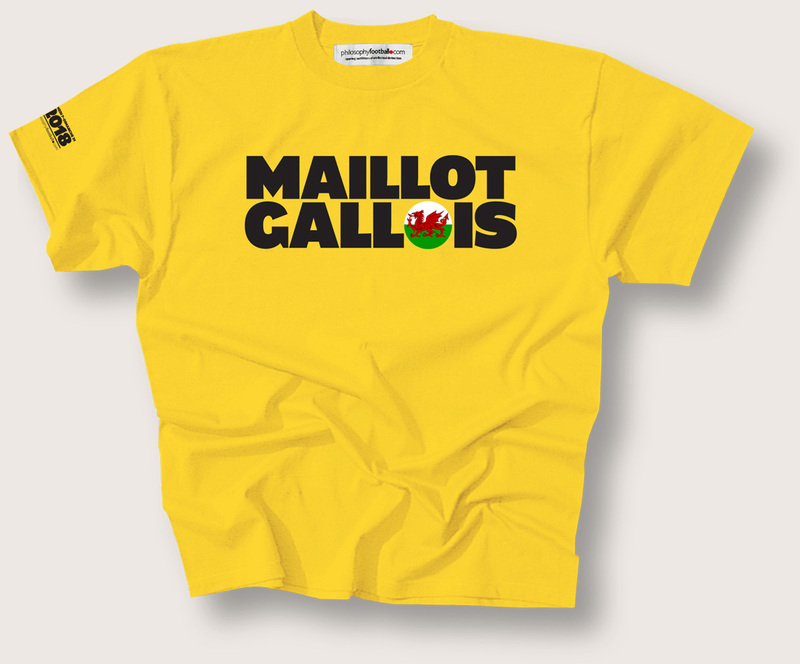 Our Maillot Gallois T-shirt is available from here.